Have you had a chance to visit the exhibition Body of Work, currently on view in our Contemporary Art Gallery? The show opened last June, but in January works on paper were rotated out of the show (they can’t stay on view for extended periods of time due to light sensitivity) and replaced with other works on paper from the collection. So even if you saw it last year, there are new things to explore. 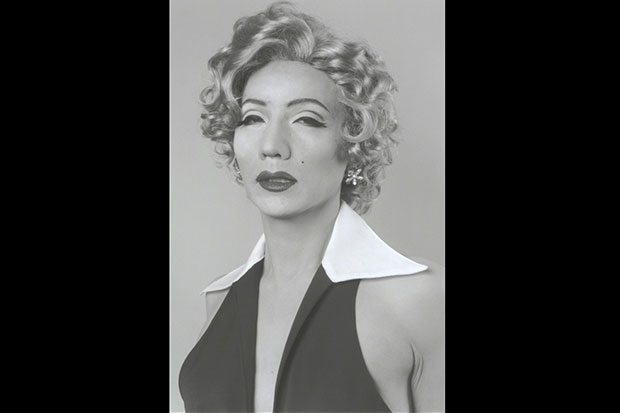 One new addition is Yasumasa Morimura’s Self-Portrait/After Marilyn Monroe—a gelatin silver print of the artist dressed as Marilyn Monroe, based on a publicity portrait of the actress from the film The Seven Year Itch. The photograph is part of Morimura’s “Actresses” series, which comprises 20 similar self-portraits in which the artist recreates iconic images of Marlene Dietrich, Catherine Deneuve, Elizabeth Taylor, Audrey Hepburn, and Brigitte Bardot. Often compared to Cindy Sherman, Morimura’s recreations of celebrity iconography and art-historical masterpieces evoke the Japanese Kabuki theater tradition of onnagata, in which men perform female roles, and challenge traditional Western notions of sexual identity, popular culture, and desire. According to assistant curator of Contemporary Art Katherine Love, Morimura’s earlier work was first shown in Honolulu 20 years ago at The Contemporary Museum (now Spalding House), as part of the group show Photography and Beyond in Japan, organized by the Hara Museum. Body of Work is on view through April 29. To learn more about the show, read Curator’s notes: Katherine Love on Body of Work. Gift of The Contemporary Museum, Honolulu, 2011, and purchased with funds derived from gifts of the Honolulu Advertiser Collection at Persis Corporation, by exchange (TCM.1997.26).